Learning is a never-ending process. 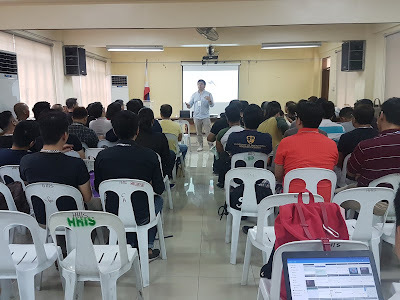 This is why LoveYourself’s Love University, the arm that pioneers the learning and development efforts of the organization, put together this year’s University Conference, a day for learning. 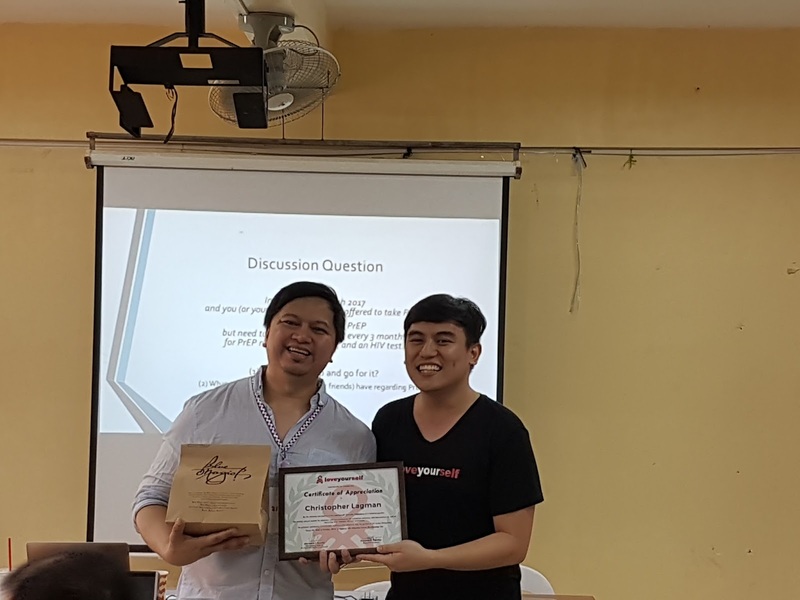 The goal is to give valuable information and resources related to HIV prevention and care initiatives for new and seasoned volunteers alike to be more equipped in serving the community. The event was held on October 22, 2016, at Highway Hills Integrated School in Mandaluyong City. Chris Lagman, one of the core founders of LoveYourself, delivered the opening remarks. He looked back on the previous years to present how this event evolved. Starting as a Counselors’ Convention in 2011 and turning into a Counselors’ and Volunteers’ Convention in the following years, this year’s event was an improved version of both to cater to all types of volunteers. To further entice and excite the volunteers, Love University decided to offer breakout sessions to allow everyone to sign up for the topics that interest them most. The breakout sessions were composed of three tracks -- namely psychological, medical, and wellness. Danvic Rosadiño, Chancellor of Love University, stated that they intentionally chose these tracks as they believe these are the three aspects that volunteers will benefit most from. Rosadiño then introduced the first speaker, Arielle Arcangel, who talked about the current and historical state of HIV in the Philippines using data from the Department of Health Epidemiology Bureau. 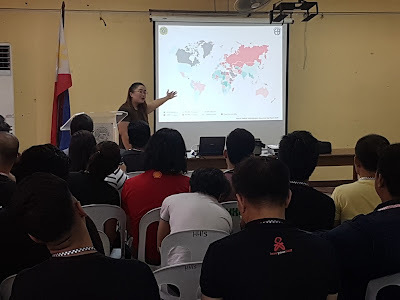 Some key takeaways from the talk was that the Philippines ranks third among increasing new infections in Asia and the Pacific -- there are 34,999 total cases reported from January 1984 to June 2016, and there are 26 newly diagnosed HIV-positive individuals per day as of June 2016. As a volunteer, it is important to better understand what you are currently going through in life. This is why the Cycle of Renewal Check was chosen as the first session for the Psychological track of the conference.The Cycle of Renewal is a paradigm developed by the Hudson Institute of Coaching that envisions our lives as a series of phases through which we transition gradually. 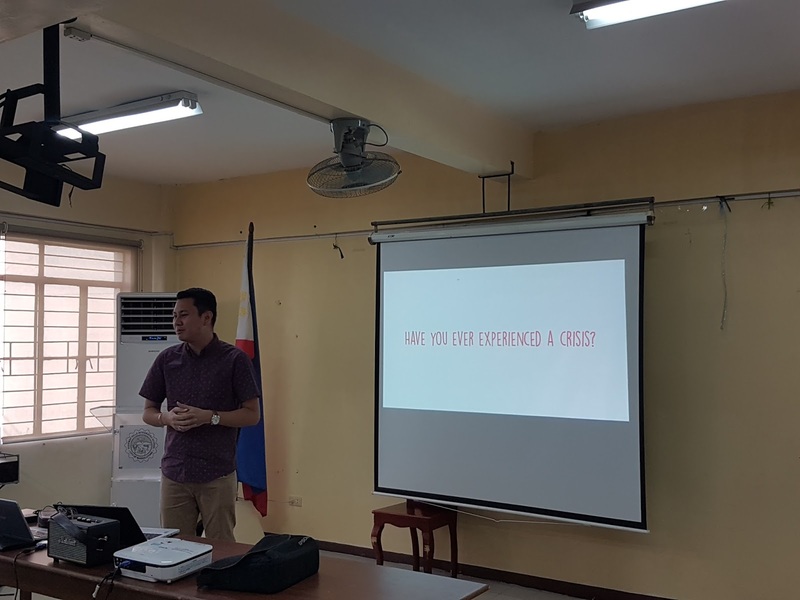 Chris Lagman, resource speaker, said that “most people believe that they have to go through life following a certain linear path, but life is a cycle.” Aside from the four phases of the life cycle (coined as “Go For It, Doldrums, Cocooning, and Getting Ready”), he also discussed the 10 life skills (Dream, Plan and Pursue, Plateau, Manage the Doldrums, Sort Things Out, Ending, Restructuring, Cocooning, Self-renewal, and Experimenting) people need to sustain purpose and passion no matter where they currently are. He added that self-assessment is vital for counselors and volunteers in order to serve others to the best of their ability. The task of LoveYourself counselors is substantial because each client goes through a life-changing experience when they get tested for HIV. 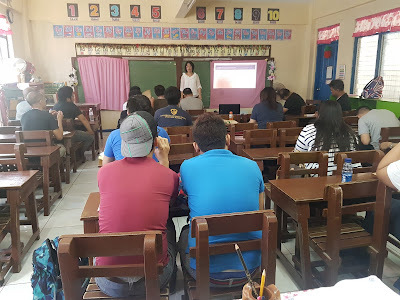 In this session, Hazel Navarro-Tan, a volunteer psychologist for the UST Psychotrauma Clinic since 2008, showed counselors techniques to keep their clients engaged, deliver results properly, and impart key messages to help clients even after they walk out of the clinic. 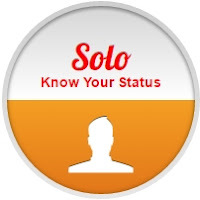 Counselors can’t control how their clients would react once they get their test results. There will be times that the response will be unfavorable and hard to manage. 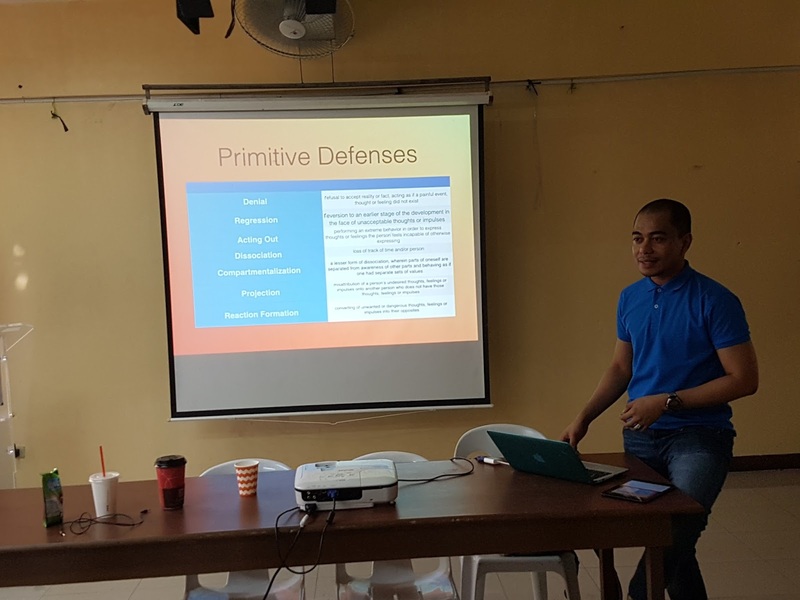 This class, led by Renz Argao, a Department of Psychology instructor in University of Santo Tomas, introduced strategies on how to respond to those difficult situations. People living with HIV, especially those who just found out about their status, are at risk of suffering from depression. Louie Lacno, Volunteer Mental Health Practitioner and Lecturer at HIV/AIDS Core Team Department of Health Region 11, helped volunteers be more familiar with what depression is, the population groups at risk for depression, and its implications to behavior and health, especially those among people living with HIV (PLHIV). 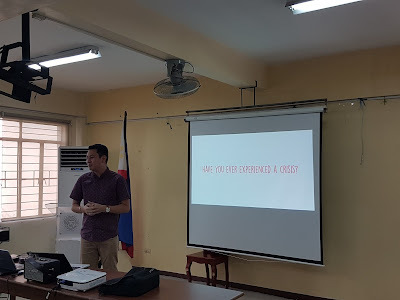 The participants also learned techniques on how to check if a client is currently experiencing depression, and to know when to refer them for primary care. For the wellness track, a yoga session led by Quino Reyes, a certified Vinyasa Yoga teacher for Yoga For Life and Beyond Yoga, was held. Yoga promotes wellness, which is something all volunteers should know how to achieve and maintain in their lives. The class involved teaching the participants different breathing techniques, meditation practices, and asanas/poses to help them relax especially when they need to de-stress. 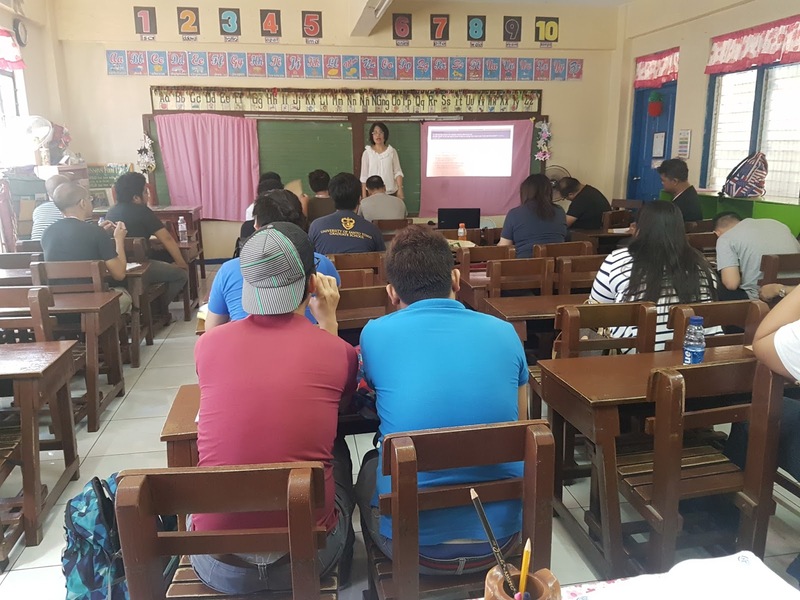 The third session for the Psychological track was specifically conducted for LoveYourself counselors to handle clients with different personalities more effectively. Counselors and volunteers alike need to know how to approach clients to better apply LoveYourself’s distinctive brand of service, one that is imbued with care and empathy. 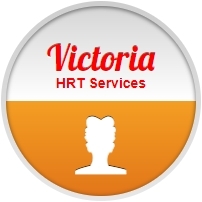 Whether dealing with an odd and eccentric, emotional and erratic, or anxious and fearful client, you must be sensitive and put their needs first. The last class for the Wellness track was a Gentle Nia session conducted by Cecilia Schrijver and Bea Tabuñar of Yoga for Life. Gentle Nia is a practice that will help volunteers release stress and be more collected. This is a safe, fun, and liberating workout inspired by martial arts, dance, and yoga. LoveYourself clinics are currently preparing to shift the screening procedures to CBS to deliver faster HIV test results (as fast as 15 minutes). In this class, resource speaker and LoveYourself Uni's clinic coordinator, Karlo Barsales, gave more information about how the screening works and conducted a demo for the participants to see for themselves. This faster screening approach has already been used during Incognito, LoveYourself’s most recent mass testing event, and will be used again in the upcoming Incognito 2.0 to be held on November 27.